A Slavic settlement belonging to the fishing village “Dresdene” was first mentioned in 1206. The name probably originated from “Drežďany”, which means wash or floodplain people. As from 1485, Dresden evolved to become a seat of the Saxon Dukes, and later Electors and Kings as well, which enhanced its reputation as a political and cultural centre. After the House of Wettin had claimed electoral dignity, Dresden became the capital of the most important protestant country in the Holy Roman Empire of the German Nation. In 1685, Dresden was burnt to its foundations. In 1694, the Saxon Elector Frederick Augustus I, also known as Augustus the Strong, succeeded to the Throne. He initiated a period of brisk construction activity, which helped Dresden become a “pearl by the river Elbe” and, because of its public museums, Dresden also became a role model. By promoting architecture and art, its extensive collection of paintings such as the Dresden painting gallery, the green vault (“Grünes Gewölbe”), the glorious Baroque architecture, Dresden Zwinger, Dresden Frauenkirche or Moritzburg Castle or the construction of the first occidental porcelain factory in Meißen in 1710, all contributed to Dresden getting the romantic byname “Florence on the Elbe”. These huge collections evolved to become the richest and biggest and most extensive in Europe and were continuously expanded on by the kings currently in reign. Following the Napoleonic regency, the industrialisation of Dresden began. As a result, Dresden also became a major economic centre. With new industries establishing themselves in Dresden, both the city and its population began to grow. At the beginning of the 20th century, Dresden became a main shipping route for tobacco and the centre of cigarette manufacturing in Germany, with more than 40 cigarette factories producing 60 percent of Germany’s tobacco products. The Yenidze was Germany’s biggest tobacco factory. Even though World War I did not affect the city itself, Dresden experienced the most dreadful days in its history during World War II. In February 1945, British and US-American planes bombed Dresden over four consecutive days, causing severe damage to almost the entire town centre and most of its suburbs as well. Dresden was literally buried under the debris of these deadly bombings, which would govern its townscape for a very long time. In the early Fifties, Dresden began to recover and rebuild most of its historic buildings. During its time as a regional capital in the German Democratic Republic, it was mainly the historic monumental buildings that were restored. 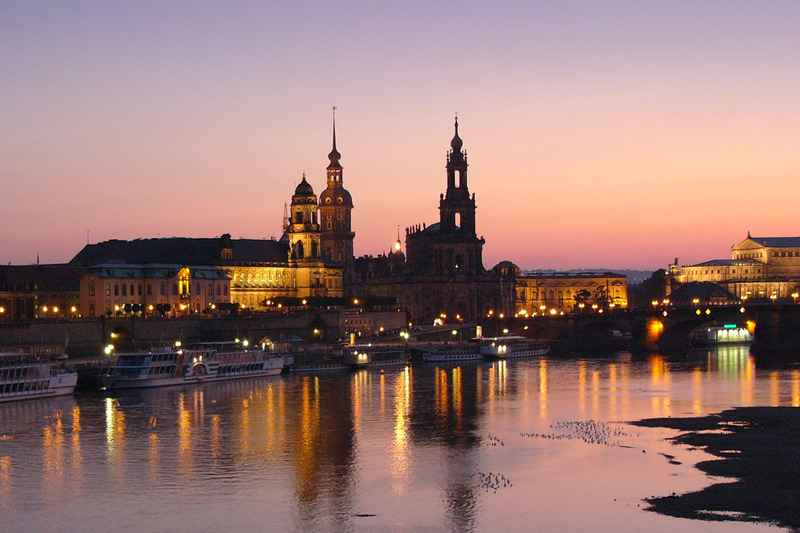 After the reunification in 1990, Dresden became the capital of the federal state of Saxony. In the following years, many other prominent buildings were restored, including the Frauenkirche, which was consecrated in 2005. However, even today Dresden is still subject to massive destruction: after the so-called “Jahrhundertflut”(flood of the century), most of Dresden was flooded by the river Elbe and its backwaters in August 2002. Flood levels reached a peak of 9.40 m and consequently even topped the levels of the most severe flood Dresden had ever seen before in 1845. Maintenance works still continue to be carried out to this date.